Studiowork by Eva Hesse (late 1960â€™s), one of the larger pieces in the ICA exhibit. Studiowork by Eva Hesse (late 1960â€™s), a smaller yet vibrant piece in the ICA exhibit. 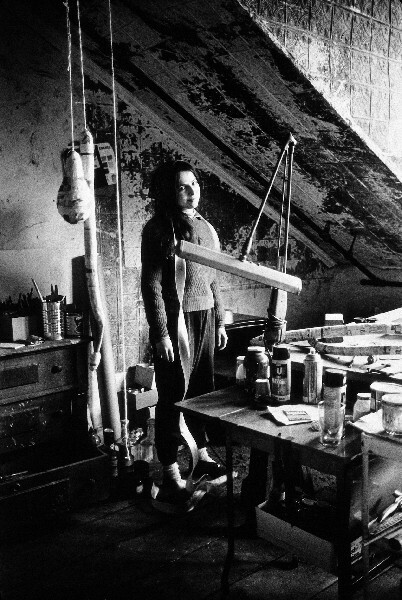 Eva Hesse in her Studio in the late 1960s in New York City. 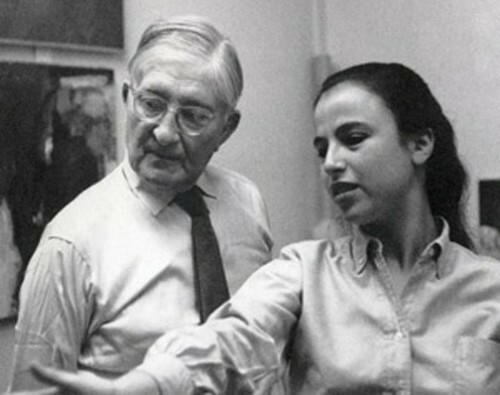 Josef Albers with His Student Eva Hesse At Yale University c.1958. Eva Hesse was a foriegn-born woman in an almost totally male-dominated American art world. Her clear gifts were so noticeable that the art community (curators, critics and other artists) recognized her and championed her work at a time when women artists struggled not only for recognition but just to be part of the artistic conversation. Though her career spanned only a decade, Hesse's unique artistic vision, energy and passion allowed her to stand apart. Her legacy lives on. Currently, Boston's Institute of Contemporary Art is presenting Eva Hesse Studiowork an internationally touring exhibition showcasing new interpretations of Eva Hesse’s historical position and highlighting her influence on contemporary sculpture. On view at the ICA from July 20 to Oct. 10, 2011, Studiowork brings together approximately fifty rarely shown mostly small sculptures drawn from major public and private collections around the world. The ICA is the only East Coast museum to present this landmark exhibition. German-born, Eva Hesse (1936–1970) was a thoroughly American artist who played a central role in the radical transformation of sculptural practice in the 1960s and onward. Throughout her extremely short but intense career, she produced a large number of small, experimental or test works alongside her medium as well as large more monumental scale sculpture. Many of these small Studioworks were left in the studio at the time of her death while others had been sold or given to friends during her lifetime. Like much of the rest of the elegant but homely beautiful work, these objects defy easy categorization. These sculptural elements have been seen as ranging from experiments, to molds, to tests, or even finished pieces. Their mystery adds to their attraction. The Surreal, ephemeral and somehow visceral qualities and textures of the monochromatic small Hesse works are neither merely preparatory objects nor necessarily finished works. They seem to capture key moments of experimentation. These pieces allow a penetrating and provocative glimpse into Hesse’s studio practice. Like the rest of her work from the 1960s until her death in 1970, Studiowork also questions traditional notions of what sculpture is. This questioning of the tradition of sculpture was a 1960s phenomenon. New and found industrial materials and coatings replaced bronze, wood and marble. An aesthetically diverse group of artists was pushing the boundaries of what and how sculpture was made. Among these artists, Anthony Caro took sculpture off of the plinth or pedestal placing it directly on the ground or floor. Starting with a minimalist aesthetic, others including artists like Carl Andre, Robert Smithson, Sol LeWitt, Joseph Beuys, Richard Serra and Donald Judd used industrial materials, geometry, grids or spirals, philosophical narratives and nonconventional approaches. But Hesse added an equisite quite personal handmade quality to her use of industrial materials, grids and 3D drawings. Using experimental and often quite homely materials to create her objects like resins, rubber tubing, plaster, papier mache, fiberglas, twine, wire, rope, latex, metal or plastic plating and wax. 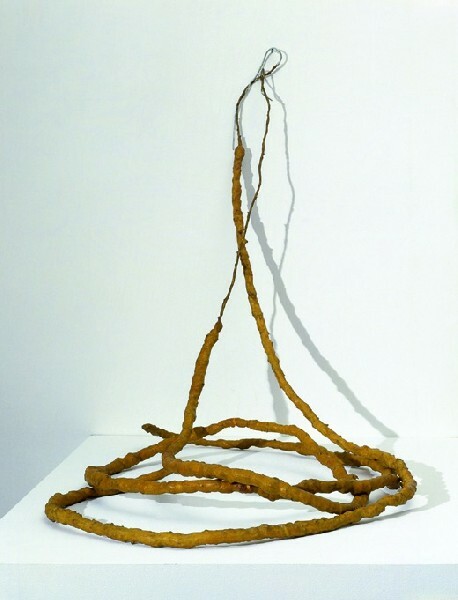 Eva Hesse's pieces are a strategic and quite influential part of this nontraditional approach to sculpture. Often, her work is a nonstark, softer Minimalism. Each element is a visual statement that is layered, minimal but sensitively nuanced by its material, form or visual texture. 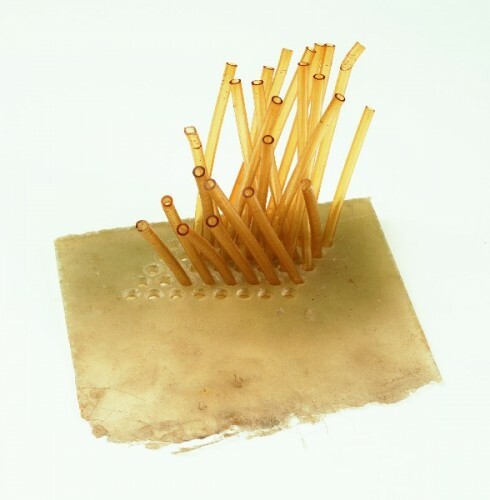 It has beeen suggested that Eva Hesse synthesized various artistic trends into her sculpture, including Minimalism, Abstract Expressionism, Surrealism, even Pop Art. Perhaps this was because she was well-trained and aesthetically sophisticated. Growing up in Manhattan and recognized early as a gifted artist, and thus at the very center of the post-War art world, she attended what eventually became the High School of Art and Design in New York City. She began college at Pratt Institute but later transferred to Cooper Union. She then attended Yale University studying with Josef Albers. Though he considered her one of his favorite students, Eva thought the Bauhaus master rigid and doctrinaire. Hesse disliked Albers teaching. She did not enjoy her time at Yale. Hesse stated that she wanted to make something which was nothing, something that pushed the boundaries of possibility and logic as far as they could go. One way in which Hesse’s work employed Minimalism’s idea of seriality is that she would make multiple versions of many pieces, but would change each of them in some way (scale, material, color, etc). She would also use pre-determined mathematical sequences in her work while adding or subtracting to or from them creating a type of assymetry thus making the piece uniquely hers. There is a particular visceral feeling to Hesse's sculpture. 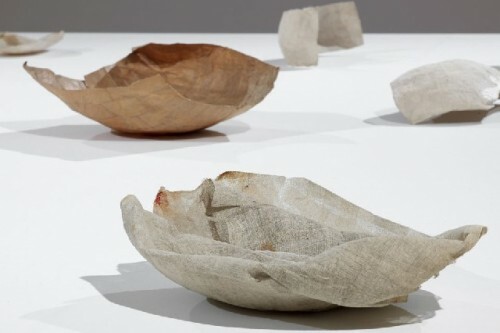 If not specifically delicate, at least personally tempered, each piece resonates with an inner connection to the viewer by its placement, structural mystery or physical context. This is true of each piece as a whole as well as in each work's internal details. There is an utter physicality to each element as well. Eva Hesse's aesthetic voice speaks eloquently through each one of her enigmatic sculptures. Hesse enjoyed the temporal quality of the materials that she experimented with. Forty years later, this has led to conservation nightmares and issues of significant restoration of deteriorating sculpture and their various components. The Hesse sense of nothingness, the oscillation between real and unreal, tension and elasticity and transparent and opaque were integral to her art. The deteriorating materials, the physical dematerialization, are part of Hesse's artistic legacy as well. One of the larger pieces in the exhibit No Title, 1966, created from nets, enamel, string, paper, metal, and cord, Private collection. According to the show's curators, the artist made several works that exist in three dimensions like sculpture, yet are attached to the wall like a painting. This one piece is a grouping of pendulous forms comprised of three irregularly shaped balls of paper that are tied with string, painted, and weighted that are placed inside netting and attached to the wall on varying lengths of cord. The pull of gravity and the organic or sexual associations evoked by the interplay between the drooping forms brings the language of the human body into the realm of Hesse's sculpture. 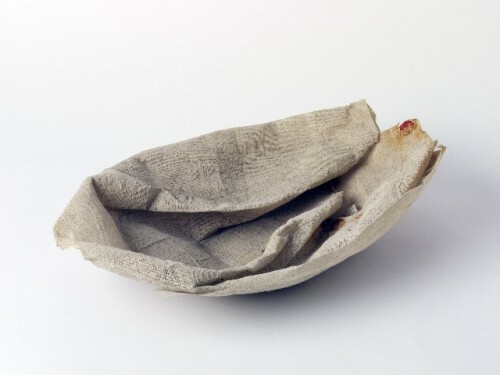 Another is No Title, 1970, made from fiberglass over wire mesh, latex over cloth over wire, Collection Albright-Knox Art Gallery, Buffalo, New York. 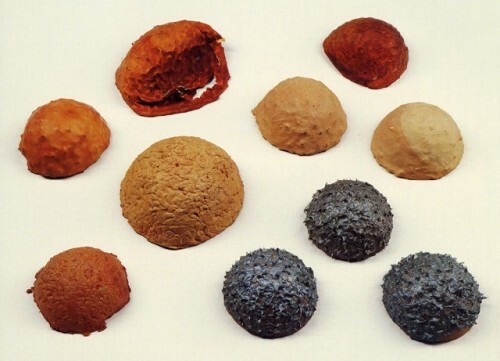 Here Hesse demonstrates her interest in experimentation with a range of unusual material. In 1967, she discovered latex (a material she knew that would eventually deteriorate), fiberglass, and polyester resin. She was attracted to the irregular shapes, surfaces, and translucency that these materials produced. Hesse used this combination of materials to create a quirky vertical rectangle that seems to be melting. Protruding from it is a long, curling length of cloth that seems to slide down the wall to the floor. Though the majority of the pieces in this Studiowork exhibit are small, the most provocative works are medium sized. Generally, the smaller pieces are less vibrant, less dynamic and less visually interesting. Though I would definitely recommend visiting this exhibition, this is ultimately a show of interesting process rather than great product. With that said, Hesse's more visually spectacular larger pieces have greater presence and a sense of completeness missing from the majority of the work in this exhibit. In a way, the limitations of this show underscore symbolically the sadly limited life and potential of Hesse herself. More would have been more. "An informative, and beautifully expressed article. Thank you. "